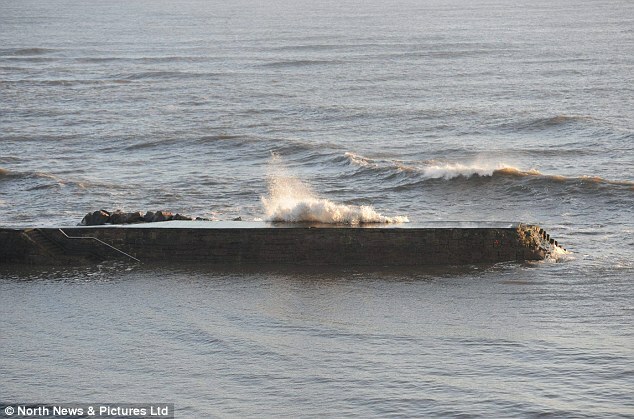 Posing for the camera, this is the last photograph taken of the 15-year-old girl who was swept out to sea when she was hit by a large wave as she stood on an exposed pier with friends. Schoolgirl Caitlin Ruddy was pictured just one hour before she was swept off the north pier at Cullercoats Bay, in North Tyneside, after being hit by a large wave just before 8pm last night. Her devastated family today paid tribute to their ‘princess’ and visited the seafront where she was last seen to lay flowers and tributes. The teenager was swept into the water after being hit by a wave as she stood with a group of friends on the pier. 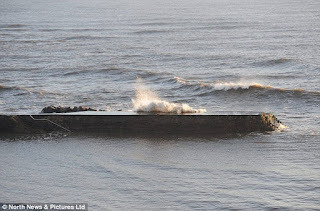 Three of her friends - a 14-year-old girl, a 14-year-old boy and a 15-year-old girl - managed to walk back to safety upon realising the high tide was causing large waves. However, Caitlin was swept off the pier and into the water by a large wave. Coastguard, police, RNLI crews and a rescue helicopter were scrambled to the incident just before 8pm, but a member of the public managed to pull the girl from the water on the south side of the bay before they arrived. She was taken to Cramlington Hospital in Northumberland by ambulance but died in hospital last night. It is understood she died following a cardiac arrest. She has not yet been formally identified. The three other teenagers were also taken to the same hospital as a precaution but police said they were uninjured. Dr Clare Guilding, who lives in Cullercoats Bay, said she cycled down to the beach after seeing up to 30 people searching the area for the missing girl yesterday evening. Peter Lilley, 28, a captain at the Tynemouth Volunteer Life Brigade, was involved in the search and said it took about 20 minutes for crews to locate the girl. He said: 'Initially the report was that the girl had been washed into the sea and we didn't know where she was. 'The lifeboat started the search at sea and we started the search on the land to see if we could spot her. About 20 minutes after that she was located on the south side of the bay. 'Our guys, the lifeboat crew, police officers and paramedics from the ambulance service worked together treating her for about 20-25 minutes before she was taken away in the ambulance. 'She was in the water for approximately 25 minutes, maybe a little bit longer. She was unconscious the whole time we were treating her. He said it was not clear at this stage 'how she ended up in the sea' but said she was 'certainly' in the vicinity of the pier. He added: 'I know her friends ended up in hospital although I don't think they were seriously hurt and I know the police will be investigating. 'It was a nasty incident last night particularly with the age of the casualty. 'It's always tense when you're looking for someone and then you find them to get them the care as quickly as you can. It was really good teamwork last night but obviously we would have preferred a better outcome. Michael Scott, 54, a press officer for the RNLI at Cullercoats, said rescuers believe the group of friends were standing on the north pier when they were 'washed over' by a large wave. He said: 'Three of them were recovered and one was still in the water. 'We noticed a casualty on the south side of the beach and we believe she was found on the beach by a member of the public who was administering CPR. 'We don't know who that member of the public is but we would like to thank him. Curtis Dunn, 19, a volunteer crewman for the RNLI who was involved in the search, added: 'When things like this happen it is sad and we give our condolences to the family. 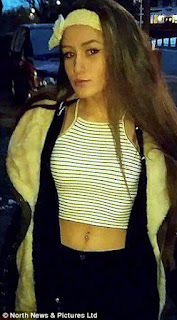 Confirming the girl died following the incident, Northumbria Police said: 'The 15-year-old girl who was swept into Cullercoats Bay, North Tyneside, on Saturday night has sadly died in hospital. Chief Inspector Paul Knox urged members of the public to take care on seafronts during unsettled conditions. He said: 'We need to remind people of the danger of the sea, particularly in the dark and cold at this time of year, when tides are high and people can be taken unawares by the strength of the waves and the inherent dangers of the sea.